DJI Tello Iron Man Edition | Nerd Much? DJI has introduced the DJI Tello Iron Man Edition drone – a fun collaboration between DJI, Ryze Tech, and Marvel. 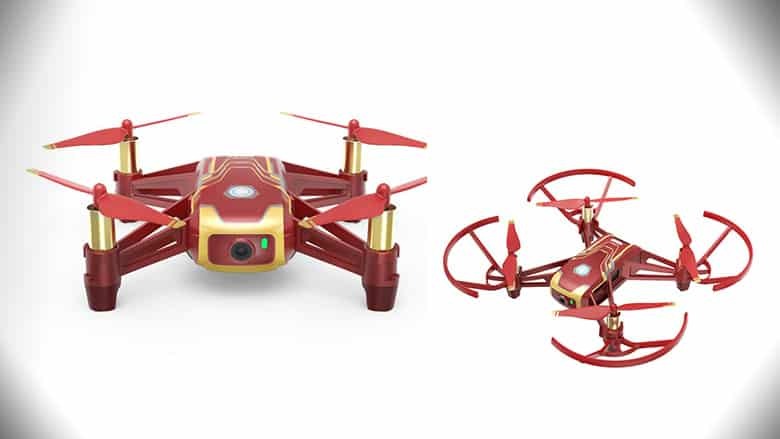 This little bugger is a mini drone sporting the same specs as the regular DJI Tello drone, but it comes with a flashier Iron Man shell based on his classic suit. The drone is flown with the Tello Hero App on any smartphone or tablet, and in that app you’ll also find a super comprehensive user guide so that you can easily learn to fly your drone. As far as other typical drone features are concerned, the DJI Tello Iron Man Edition has Low Battery Protection, intelligent flight functions like 360, Throw & Go, and 8D flips (which allows you to do flips at the push of a button in 8 different directions). It transmits in 720p HD format and it can snap 5MP photos. Obviously, that pales in comparison to today’s drone standards, but you’re not buying this drone for the camera now, are ya? It has a 13-minute flight time and has the standard 100-meter maximum distance you’ll find in most other drone toys on the market right now. This is certainly an interesting direction for DJI to go in, especially when the company is known for its high-end quality drones. Hopefully, the Iron Man Edition is just the start of DJI’s partnership with Marvel, as we’d love to see more Marvel drones from them in the future. For now, if you’re interested, you can pick up the Iron Man Tello on Amazon, Newegg, or directly from the DJI store.